Contemporary Summer Houses - Who Has The Best Contemporary Summer Houses? Contemporary summer houses are not only an ideal place to relax in the garden and a perfect location to entertain guests before or after a dinner party, they also make a statement about you and your garden. 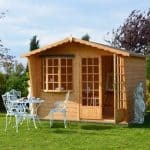 They’re among the most stylish garden buildings we review, but with a diverse choice available, which one is best for you? Don’t worry, help is at hand with this WhatShed guide to the very best contemporary summer houses that can be bought online in the UK today. After researching contemporary summer houses, we were pleased to find ten excellent examples worthy of a place within our league table. We then ranked each building according to varied factors such as price, value for money, durability and aesthetic appeal – after all, that’s one of the primary considerations in this category of garden building. One person’s definition of contemporary can differ from another’s of course, so when looking for contemporary summer houses we wanted models that had visual appeal high on their agenda, and that eschewed traditional summer house designs for something exciting and modern. 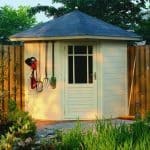 Whilst these modern garden buildings may not be as numerous as traditional summer houses, we were pleased find ten very high calibre and yet very different models for our league table. With such diversity, selecting an overall champion was difficult. It’s well done then to the Waltons contemporary garden room with side shed. 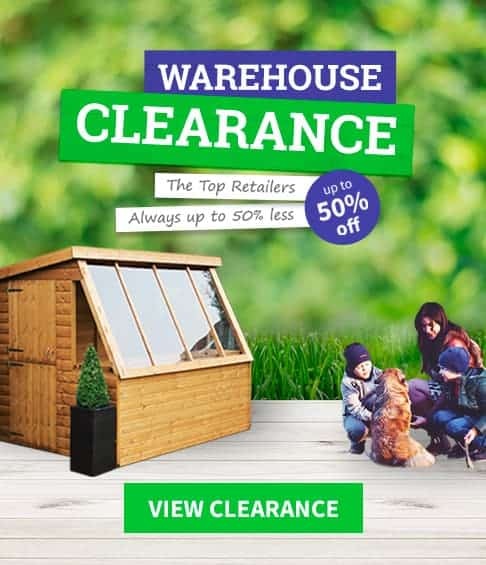 It’s very attractive, well priced, and adds extra value with its secure storage area, thus clinching top spot in our league table of the UK’s best contemporary summer houses that can be bought online in the UK today. 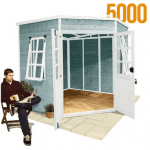 From summer houses to garden sheds, WhatShed bring you in depth and independent reviews that can answer your garden building questions. The best contemporary summer houses are very attractive garden buildings that can become a beautiful feature in their own right, but that doesn’t mean that they can’t be practical buildings too. 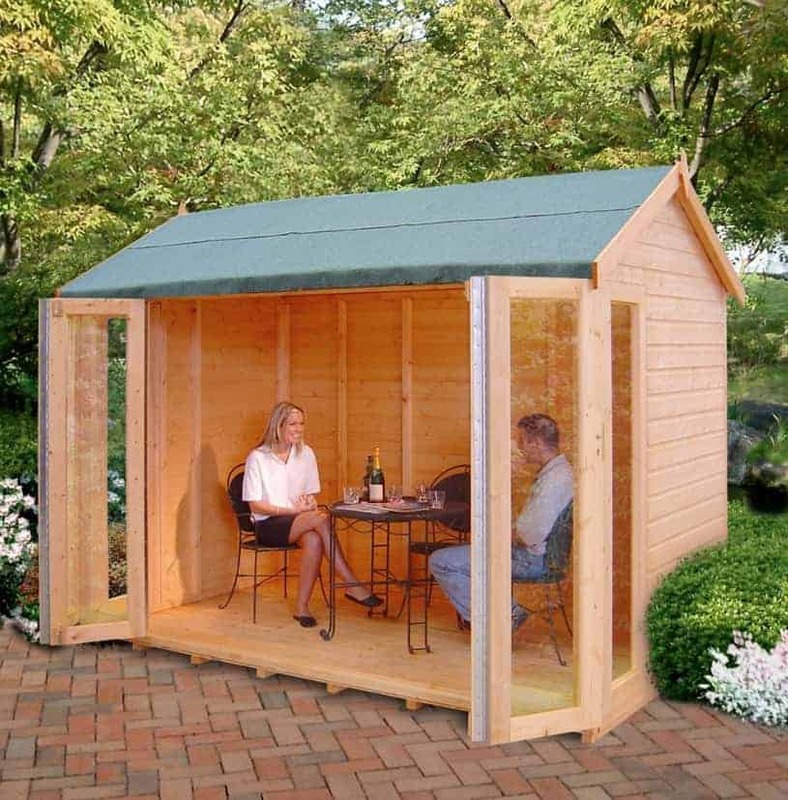 This dual function is summed up perfectly by this Walton’s summer house. It’s certainly eye catching with its solid lines and plethora of glass, but it performs two differing functions very well. 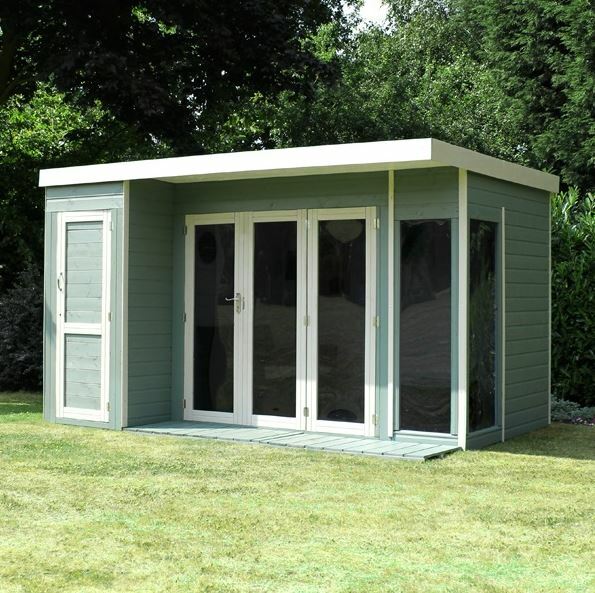 The main body of the summer house is an excellent place to relax and work in, thanks to the amount of natural light that floods in, while its handy side shed provides a safe and secure environment for storing anything from electrical equipment for use in an office setting to tools. This, along with its good value and its reassuring 10 year manufacturer’s warranty, is enough to earn it the top spot in our league table. The reason that the side shed is so secure is that it has no windows opening onto it, meaning that passers by will be unable to see if anything valuable is kept inside. It also has a key operated lock, a feature we were pleased to see replicated on the glazed double doors that provide the main entranceway. 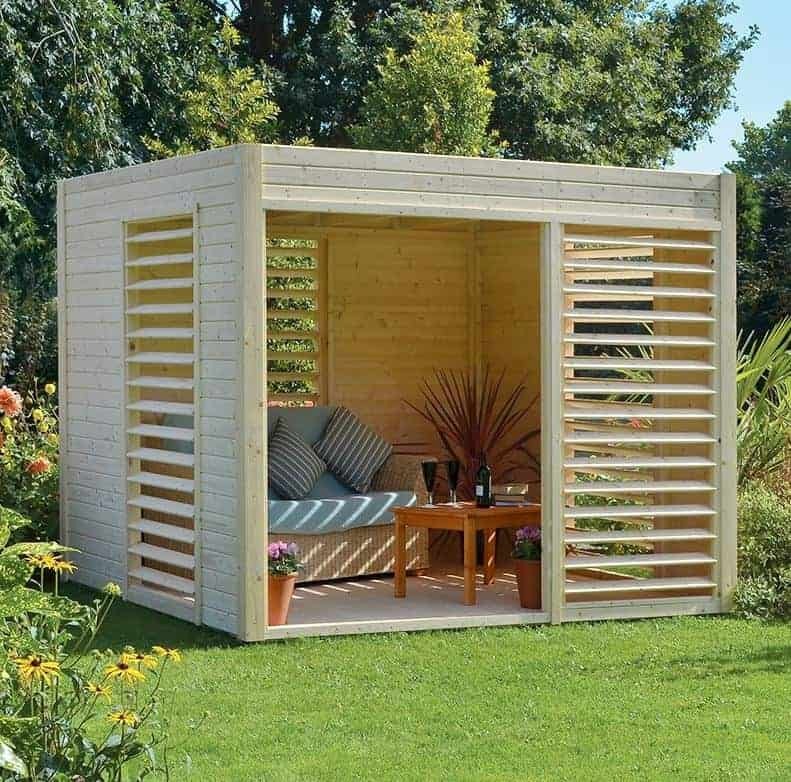 With a base area of 3.65 x 2.50m these are also among the larger contemporary summer houses we’ve reviewed, which once more adds to their versatility. We’ve reviewed a number of contemporary summer houses that boast a curved roof, and it’s not only a practical solution that carries rainwater quickly away, it’s also a very eye catching design feature. 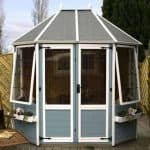 This summer house from BillyOh, however, is the most attractive of all the curved roof summer houses that we’ve seen, and that helps to elevate it into second place within our WhatShed league table. What makes this stand out is not only the roof, but also the eye catching white detailing around the roof and across the tongue and groove cladding. We were also pleased to see that this trim colour can be changed to suit the customer’s needs. At approximately ten foot by ten foot, and with glazing dominating the whole of the frontage, these contemporary summer houses make a great place to relax on a sunny say. That becomes even more enjoyable with the right furniture inside, and so it was good to see that the centrally positioned double doors have a wide opening that makes it easy to move items of furniture in and out. At less than a thousand pounds we feel that this represents excellent value for money, but it should be noted that a floor is not supplied as standard. Nevertheless a suitable floor can be added for as little as eighty pounds, so don’t let this omission put you off. This is by far the smallest of the contemporary summer houses in our league table, being based upon an area of approximately seven foot by seven foot. 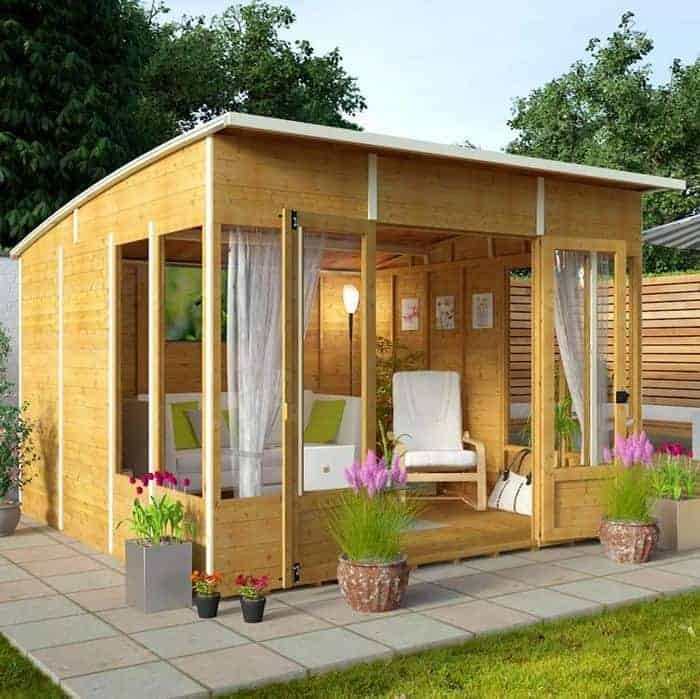 This makes it especially useful for those who want a good looking modern summer house yet don’t have a lot of lawn space on which to situate one. Even more space can be saved, as the five sided design of this summer house means that it can be placed snugly into a corner. We’ve seen lots of corner summer houses, but what gives this one its contemporary appeal is the predominance of glazing, which in this case is shatter proof styrene, over glass. It’s a look that we found very striking, and it stands above the other corner garden buildings we’ve reviewed. Another stand out feature of these compact yet contemporary summer houses was their value for money. 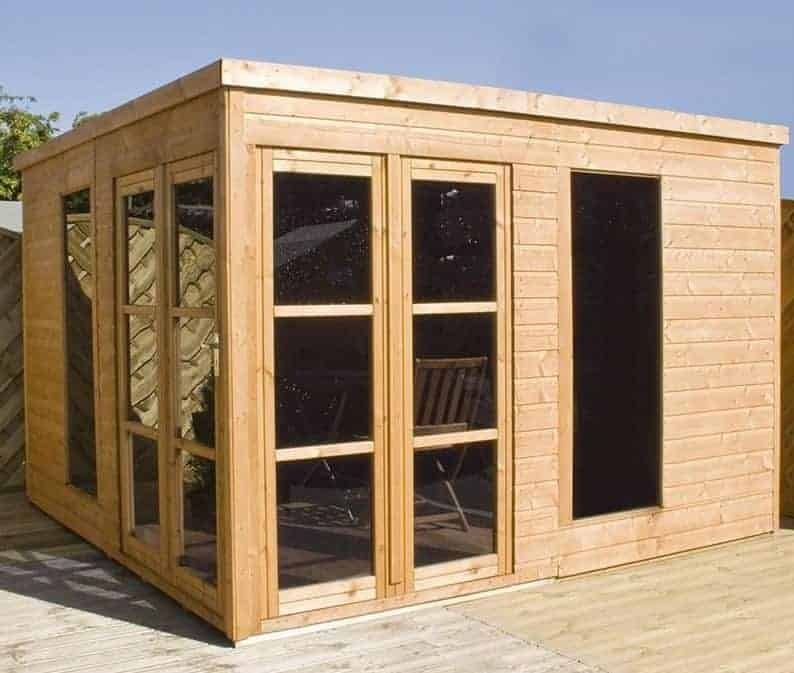 With a price tag of less than seven hundred pounds it means that more people than ever before can have the advantages that a modern summer house brings, and added value is provided in the shape of a 10 year manufacturer’s guarantee against rot. If you’re looking for a relatively small and inexpensive summer house with a modern and stylish appearance, then this could be at the very top of your shortlist, and that’s why it makes it into the top three of our league table. Once again these contemporary summer houses are among the smaller we’ve reviewed, with the eight foot by eight foot base area meaning that you won’t have to give up too much precious lawn space when positioning it. It also has the curved roof that we’ve come to associate with Helios summer houses, yet whilst we found that very attractive it doesn’t have the little stylistic flourishes of the BillyOh 5000 model we looked at earlier, and that accounts for their respective positions within our league table. We were impressed to find that 12” thick tongue and groove cladding had been used not only for the walls, but also for the roof and the floor. 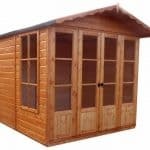 That should make these contemporary summer houses very stable and strong once assembled, so you won’t have to worry about having heavy furniture inside your summer house. We were pleased to find that a ten year manufacturer’s guarantee against rot is provided as standard as well, and although this is dependent upon keeping up an annual treatment schedule, on a summer house that’s relatively compact such as this it shouldn’t prove too onerous a task. 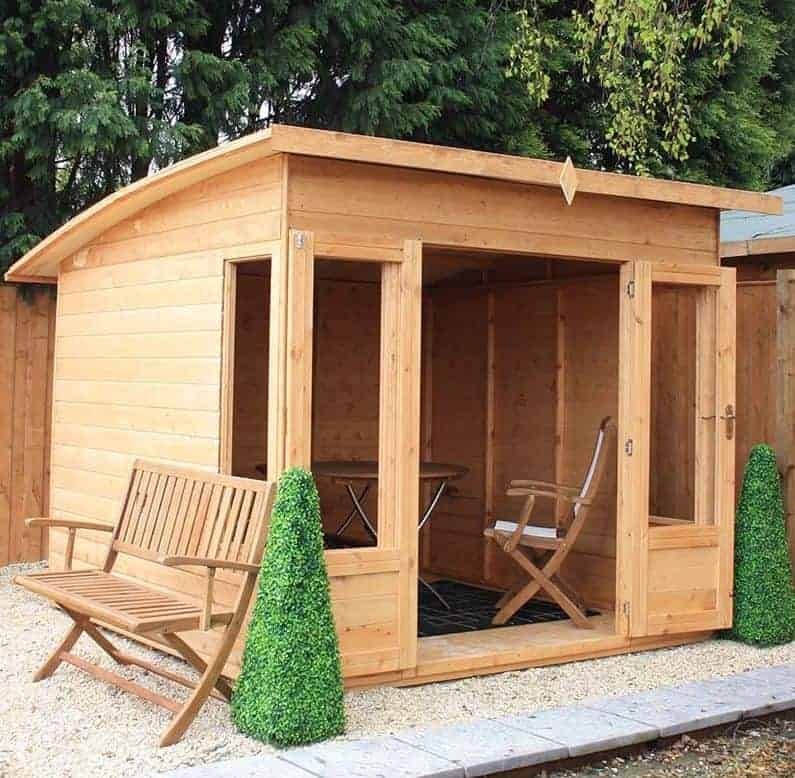 This is a summer house that’s sure to attract admiring glances from your neighbours, and with its well illuminated interior we feel it would make a great garden office as well. What transforms these ten foot by eight foot summer houses from the traditional to the contemporary is the use of bi-fold double doors. It means that with the door closed it can look like a well built and attractive, yet classically designed, apex roofed garden building. When the doors open, however, they fold out to the full width of the frontage, creating a very contemporary feel. It’s ideal for a sunny day, as it means that you can dine in comfort inside your summer house, and yet have the refreshing breeze around you as well. It’s like dining al fresco, indoors. It’s also ideal for working in, providing easy ventilation whenever needed. These contemporary summer houses are among the strongest that we’ve reviewed, and should feel very sturdy and reliable once the installation process has been completed. That’s because the shiplap cladding that locks tightly together and keeps rainwater out is supported by a 34x34mm frame. That’s thicker than we usually see, and it can be especially advantageous if you plan on using these contemporary summer houses in a windy or exposed area. Once again a 10 year warranty is installed, which we always feel is a value adding feature, as well as one that brings added reassurance to the customer. There are many functions that contemporary summer houses are just perfect for – for example, they can be used as a spring and summer office for people who work from home, or a place to relax inside with family and friends, or even a place to pursue a hobby. 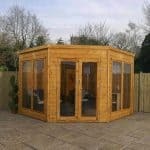 As the name of this Windsor summer house suggests, this model is also ideal for use as a garden room or as a pool house. That’s because it has lots of glazing across both the front and one of the sides. We can easily imagine it being used as the site for a home gymnasium, or a home sauna. One of the stand out features of these contemporary summer houses is that they feature not one but two sets of bi-fold doors, making it very easy to move even large and bulky items in and out. 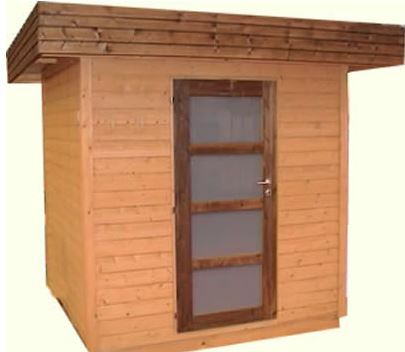 We were pleased to find that these doors feature a key operated locking system as well, which with the addition of tough and virtually shatter proof styrene glazing, makes these a much more secure garden building than you may feel at first sight. Another touch that we really appreciated is that the two long styrene windows are both tinted, providing relief from the brightness and heat of the sun on a particularly warm day. We’ve reviewed lots of garden buildings in all shapes, sizes and forms, but this has to be not only one of the most modern looking examples, but also one of the most attractive. It caught our eye from the moment we saw it, thanks to its unique design based upon an open frontage with louvre panels on all four sides. To our eyes this had an almost Mediterranean feel but it also undoubtedly contemporary in its design and outlook. This makes it a deserved entry in our WhatShed top ten, and the only thing preventing it from achieving a higher position is its lack of an extended guarantee. We were pleased to find that these contemporary summer houses are not only striking to look at, but also very strong and sturdy. That’s because they utilise 19mm tongue and groove cladding that’s over fifty percent thicker than that which we normally see used on the mid sized summer houses we review. Ventilation certainly won’t be a problem in the nine foot by nine foot interior, and thanks to the strong mineral felt roof rain won’t be a problem either. We feel this an ideal place to dine with family and friends on a summer evening, and it’s available at a good value price too. These tough and strong contemporary summer houses take their design inspiration from a traditional brick and mortar house, but then give it an exciting and very modern twist that we feel is sure to draw compliments from all who see it. The glazed single hinged door and rectangular style window have both been designed with aesthetic appeal as a main consideration, and they drew our eyes to them from the moment we saw them. Unusually for the summer houses we review, the window features frosted glass as well, which we feel can be an important boost to security. What we particularly liked about these contemporary summer houses, in addition to their very stylish looks of course, is that they come with a number of customisable features. For example, the pyramid roof can be coated in shingles in various colour schemes, and with either laminated or rounded shingles. It’s also possible to add an initial pressure treatment which then gives a very long lasting anti rot protection. This does add considerably to the asking price, however, and as this is already higher than average for a ten foot by ten foot summer house this has had to be taken into consideration when considering the final positions within our league table. One of the most attractive things about contemporary summer houses to many people is that it gives them something unique and original in their garden that’s different to what their friends and neighbours have; after all, style isn’t only something that’s applicable to the house itself but to the landscape around it as well. 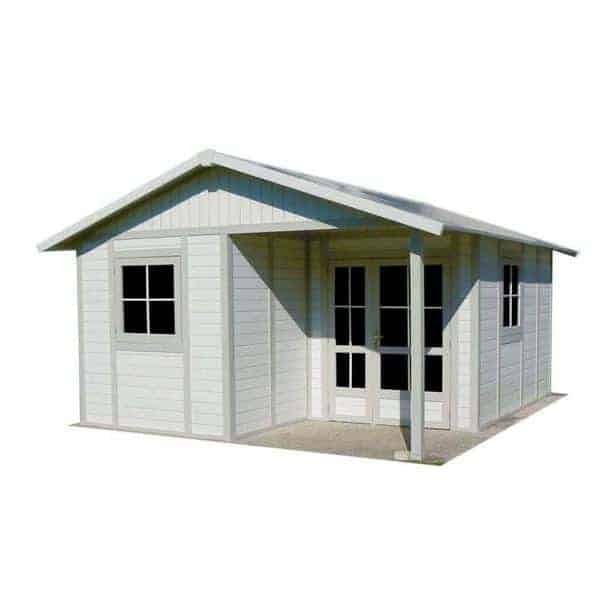 That’s where this Zaffiro summer house scores very highly; it has a very eye catching and very modern design which may not appeal to some lovers of traditional garden buildings, but which we feel will fit in excellently with modern designer gardens. There were two things about these contemporary summer houses that hit us from the moment we saw them. One was the centrally positioned single door, which we were pleased to find included a secure key operated locking system, and the large flat roof above the summer house itself. We were also pleased to discover that an insulated roof can be opted for, which should make it an all year round garden building. 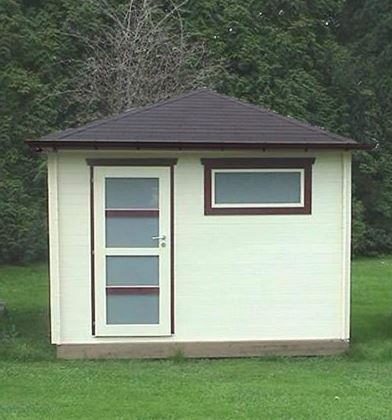 If you want something truly unique then this could be the summer house for you, although it does come with a high asking price for a building with a base area of 6’7” X 6’7”, especially as no extended warranty is provided with it. These are by far the largest of the contemporary summer houses in our league table, with the sixteen foot by thirteen foot base area meaning that they can become almost a home from home. 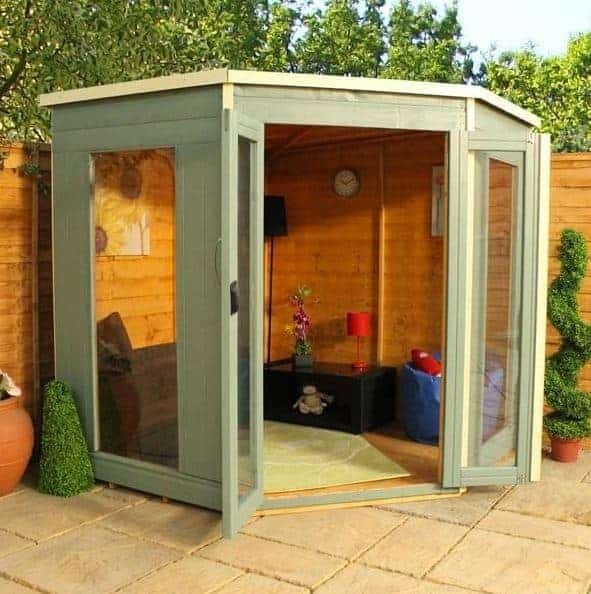 Certainly we can see these being used for multiple purposes, with one area being used for leisure purposes, perhaps as a games room or garden gym for example, while another area could be given over to office or business purposes. We were pleased to find a 10 year manufacturer’s guarantee as well, although the high asking price ensures that this occupies the final position in our WhatShed league table. This is also the only one of our contemporary summer houses to feature PVC rather than timber cladding, but it’s this that helps give it a contemporary look despite it having an otherwise traditional design even down to the inclusion of a very useful porch area underneath the overhanging apex roof. Plastic cladding brings many advantages with it, by which we mean that it is relatively quick and easy to install, it won’t have to be treated by the customer, and it won’t be prone to wet rot, or insect or rodent attack. It doesn’t need to be painted either, as it comes in a pastel blue and white colour scheme that we found very attractive, and very contemporary looking as well.